Please list your preferred six cities, states, or countries worldwide! Big or Small! If we have any questions or trouble locating something on your list we will be sure to reach out. Thank you! Set of Six! 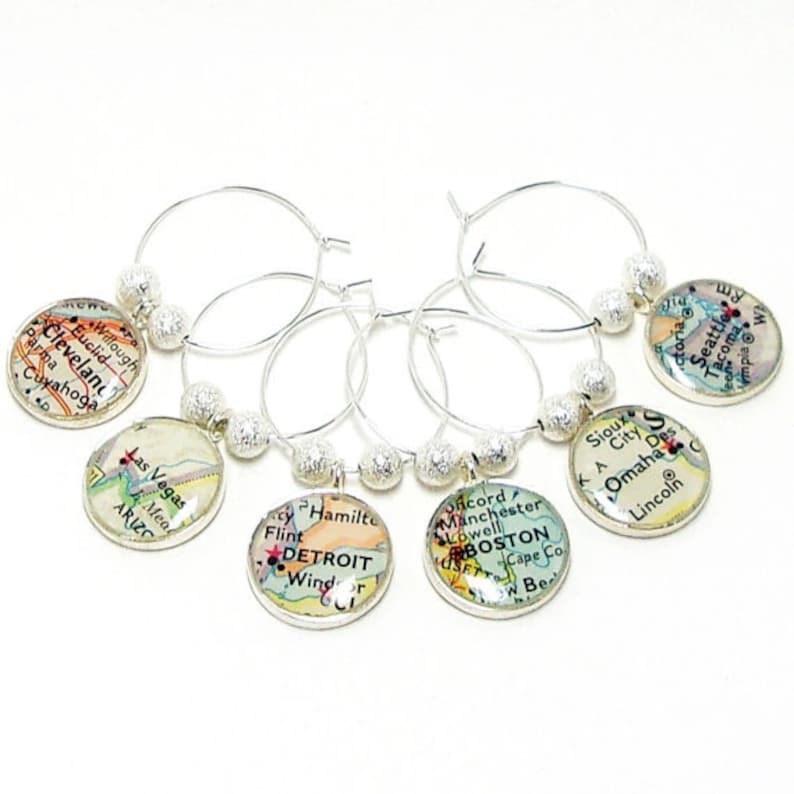 Create your own Vintage Map Wine Glass Charms! - Select your preferred finish Antique Brass or Silver Plated. All the resin I use to create my items is hand poured, creating an unbreakable, waterproof seal to ensure the preservation of the map I use only vintage maps to insure that each piece is truly unique. The charms are 5/8" round and are accented with a brass bead on either side. The wires measure 1 inch around. Please allow me 7 to 10 days from the day we receive your order to create your perfect Wine Glass Charms. If you need your order sooner please contact us. Each piece comes in a gift box. All of my items are handcrafted with care. I am always happy to send you a preview of your location before or after your purchase. If you prefer a preview please message me. All the brass I use is nickel free and lead free. To properly care for your wine glass charms clean with a damp towel. Do not place in dishwasher. During the Holiday Season we will be offering Holiday themed gift wrapping tied with twine. Throughout the year paper will be suitable for any event. CUSTOM Vintage Map Wine Glass Charms. Set of Six. You Select Locations Worldwide. Wine Charms. Personalized Wine Charms. Unique Wine Charms. CUSTOM Vintage Map Wine Glass Charms. Set of Six. You Select Locations Worldwide. Travel Wine Charms. Unique Christmas Gift Idea. CUSTOM Vintage Map Wine Glass Charms. Set of Six. You Select Locations Worldwide. Housewarming Wine Charms. Housewarming Gifts. New Home. Set of Six. CUSTOM Vintage Map Wine Glass Charms. You Select Locations Worldwide. Travel Wine Charms. Personalised Wine Charms. Wine Charms. These are AWESOME! We love them! Great sale experience! My mom loves this- thank you! Very nicely made and lovely presentation for a gift. They turned out beautifully!! Thank you so much! ** For payment we accept PayPal and major Credit Cards. Feel free to contact me for check out and payment help or if you have any questions, comments, or concerns. Offering the best customer service is our highest priority. If you are not satisfied with your purchase, please contact me. I will exchange the merchandise once it is returned to me as long as the merchandise is in its original condition. The buyer is responsible for return shipping. If I make a mistake on your order, I will refund or exchange the purchase price and any related shipping charges. I reserve the right to refuse a return or exchange for any reason. Please contact me before leaving feedback so I can do my best to make sure you have a positive experience. *If your item should need to be repaired or adjustments need to made at anytime I will be glad to do so. Please allow 7 to 10 days for Custom Jewelry, Accessories, or Map Prints to be created. All non-custom items are shipped within 48 hours of your order. Each item is individually boxed and packaged with care. I will ship your items to the address entered in the Etsy checkout. If this does not match your paypal address, please note that I will ship to your Etsy address. Shipping within the United States takes 3 to 5 days. International orders may take 7 to 15 days to be delivered. Occasional delays due to customs do happen. Please allow for extra time for your international orders to arrive. *Please contact me should there be a lost or damaged package and we'll find a solution. All of my jewelry, accessories, and art prints are made from high quality materials. Our items are not intended for children as some items are small or contain small parts. If you are interested in carrying our jewelry or accessories in your shop please contact me. Please include your store name, location, any specific products you are interested in, and any packaging requirements you might have or would prefer. CUSTOM Vintage Map Wine Glass Charm Set. You Select Locations. Anywhere In The World. Wedding Favors. Wedding Bridesmaid. Wedding Gifts. Double Sided Custom Vintage Map Keychain. You Pick Any One or Two Cities Worldwide Or Add a Personalized Quote, Names, Dates, Photos. One Custom Vintage Map Tie Clip And Cuff Links Set. You Select Locations Worldwide. Destination Wedding. Travel Wedding. Groomsmen Gifts.